Butterflies & Blooms has moved to the Regenstein Learning Campus and I have good feeling it’s going to be the best season yet, because we currently have a plethora of butterfly species native to Brazil. The Chicago Botanic Garden is celebrating Brazil in the Garden this summer, and Butterflies & Blooms is part of the celebration. Since we first opened Butterflies & Blooms, we have sought to display the most beautiful butterflies in the world, both exotic and domestic. Naturally, the Amazon rainforest is one of the most biodiverse regions on the planet. A whopping 60 percent of this precious treasure lies within Brazil. Brazil is home to thousands of butterfly and moth species (in comparison, all of Europe has about 300 species), and scientists have only recorded a fraction of the Lepidoptera species of Brazil and the greater Amazon rainforest. You can find dozens of butterflies native to Brazil and neighboring countries in the exhibit on any given day. Currently, we have beauties such as the giant owl butterfly (Caligo memnon) and its close relative, the forest mort bleu (Caligo eurilochus). These two butterflies are often confused with moths because of their earth-toned camouflage and also because they are usually found resting on a shady tree branch during the heat of the day. The large tiger butterfly (Lycorea cleobaea) thrives in the tropical rainforests of Brazil; find it here in Butterflies & Blooms. Photo ©Anne Belmont. 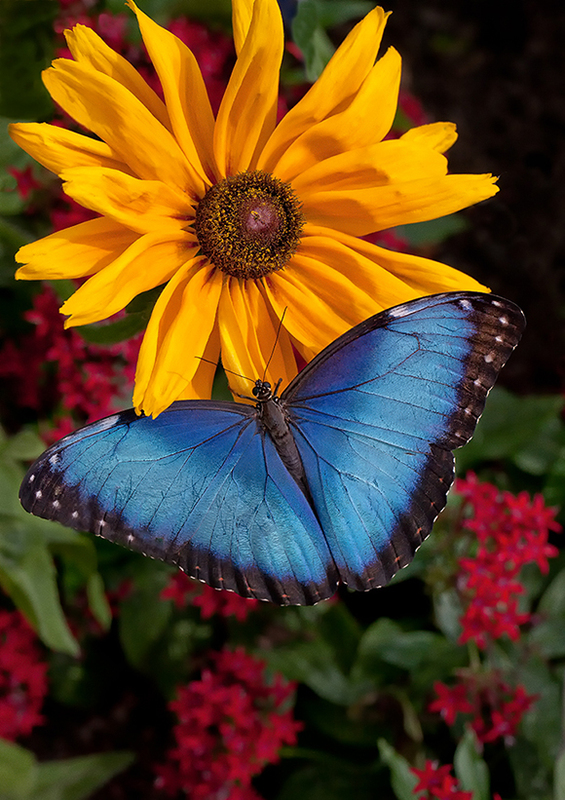 One of our most popular butterflies, the blue morpho (Morpho peleides) is another Brazilian native. Photo ©Anne Belmont. Another pair of Brazilian butterflies that grace the exhibit are the grey cracker (Hamadryas feronia) and the starry cracker (Hamadryas laodamia), They are aptly named, since they can clap their wings while flying in order to make a percussive cracking sound as a means of communication. They use this talent when predators approach, to declare territory, and, of course, for mating. While the grey cracker blends into its environment with its intricate, drab coloration, the starry cracker is very showy, coated with brilliant blue specks on a dark blue field. Looking at it can feel like looking up into a starry night. At Butterflies & Blooms, you can always find at least a few different species of longwing butterflies (Heliconius). 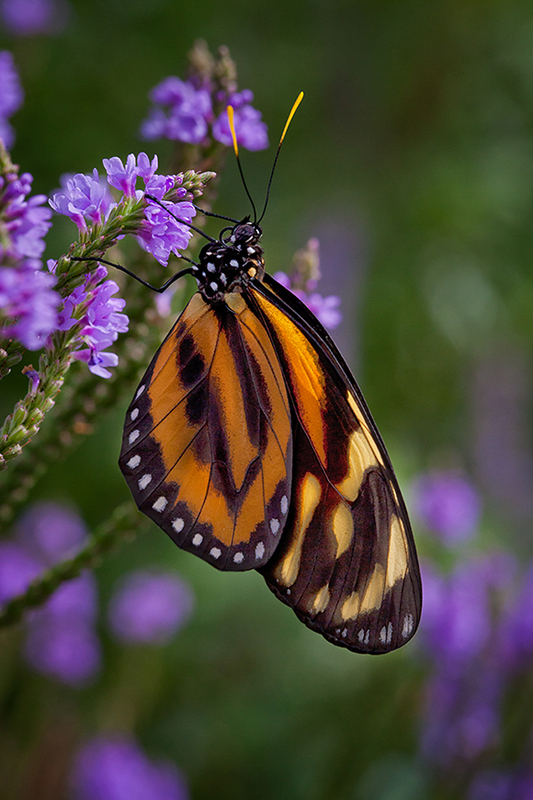 Longwing butterflies have been extensively studied since Victorian times, because they display numerous forms of mimicry. In the late nineteenth century, the naturalist Henry Walter Bates traveled to Brazil and studied these butterflies. He noticed that Heliconius erato would mimic the coloration of other Heliconians, because they were poisonous. This particular form of mimicry was coined “Batesian mimicry” after the naturalist. When Bates returned from Brazil, he used his findings to help support Charles Darwin’s theory of evolution. Another naturalist by the name of Fritz Müller observed what became known as “Müllerian mimicry”—also while studying longwings in Brazil. In this case, he noted that multiple species of poisonous butterflies will adopt the same coloration, making it easier for them to be recognized as poisonous would-be predators. Müller’s studies also led him to support Darwin’s theory of evolution. The Amazon rainforest continues to be a scientific cornucopia to this day. The next time you visit Butterflies & Blooms, check out the owls, crackers, and longwings, and remember that they all represent the natural wonders of the Amazon rainforest and Brazil. Then take a walk through the Garden to discover more of the vibrant plants and colors of Brazil. Patrick, you are the best!! When I have questions, you have the answers!! Our visitors never leave without shared knowledge about butterflies. Thank you for educating us about butterflies! Thank you for the kind words and please keep asking questions!